Affordable, easy-to-use event software. Ticketing, registration, check-in, badge printing and more. Our event check-in software is filled with big-event features, the kind usually found in expensive “event software platforms.” At EventNut, we don’t make “platforms.” We make feature-rich software and tools, and we make them affordable for any event, large or small. 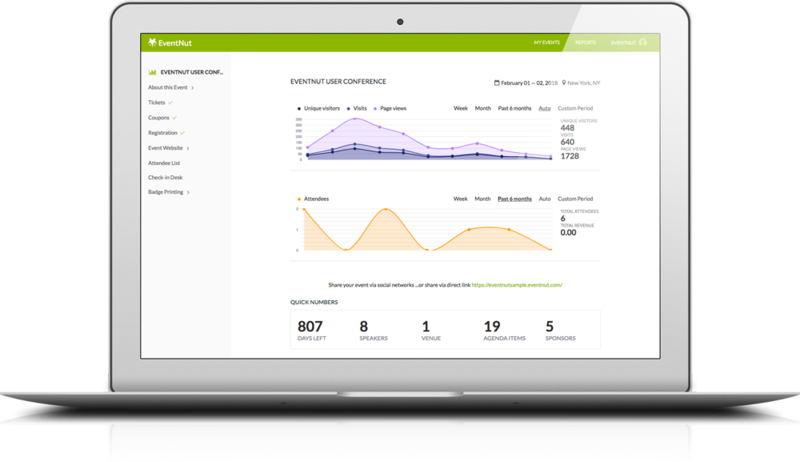 EventNut’s software and tools can be grouped into four “pillars” of check-in preparation and implementation. Each pillar’s underlying tools are highly focused and functional. They all work well together. EventNut software is really easy to use. Skip the spreadsheets. We make electronic check-in easy. Better badges. Faster, more accurate attendee check-in. Build a modern event website or registration page. Collect the registration data your event needs most. Flexible, feature-rich online ticketing. The lowest fees. Use EventNut with PayPal, get your money right away. Alert staff instantly when important attendees check in. Our campaign email utility makes it easy to keep in touch.